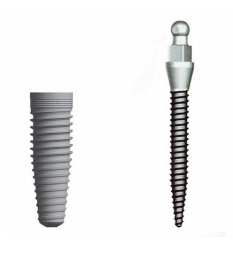 Mini dental implants are the most innovative dental implant type. Though they are smaller than the traditional dental implant, they are just as strong and effective. Mini dental implants carry out the same function as traditional dental implants, providing patients with an alternative option for tooth/teeth replacement. Starting from the time they were first implemented, mini implants have gained a large amount of attention. In addition, they are frequently inquired about. Their small size and narrow structure makes them a high demand and highly appealing smile restoration option. Both mini dental implants and traditional dental implants are made up of a titanium alloy material. Other than their similarity in material make-up, they differ in many ways. The mini dental implant measures 2.5 mm in diameter, whereas the traditional dental implant is approximately 5 mm in diameter. The size of these implants make this option more cost effective and less invasive. 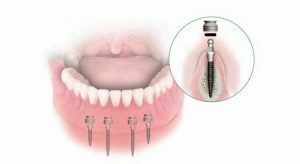 Since the screw that is inserted into the jaw is much more narrow, no drilling is required. Upon evaluation at one of our three TeethNow locations, you will find out which treatment is best for you. After your consultation with your doctor, your assigned treatment plan coordinator will go over your treatment options, as well as your financial options. Your X-Ray and CT-Scan results will determine if you have a sufficient bone density to support your mini dental implants. If you are approved to receive our procedures with these implants, you will be on your way to a brand new and transformed smile. For mini dental implants and other full smile restoration options in New York City, Long Island, or New Jersey, visit one of our three convenient locations! Schedule your free consultation by visiting our website or calling us at (212)843-4444.